Planning your Giving Tuesday Fundraising Campaign starts today with these steps for pre-launch and campaign management. It’s just about six weeks from Giving Tuesday, the international day of giving, and just enough time to start putting together your Giving Tuesday Fundraising Campaign. The day follows Cyber-Monday in the United States and is on December 1st for 2015. Six weeks isn’t normally enough to fully pre-launch a crowdfunding or fundraising campaign but you don’t want to miss out on the biggest day of the year for non-profit fundraising. On Indiegogo alone, more than 350 organizations raised $10 million from 45,000 backers on Giving Tuesday last year. Giving Tuesday can mean a big boost to rewards-based crowdfunding campaigns as well, especially if you partner your campaign with a social cause. I’m going to write the rest of the post out for a Giving Tuesday fundraising campaign but the process can easily be used for a business crowdfunding campaign. Follow the quick outline below to make your Giving Tuesday fundraising campaign a success and check out Step-by-Step Crowdfunding for the full process on raising money in the crowd. 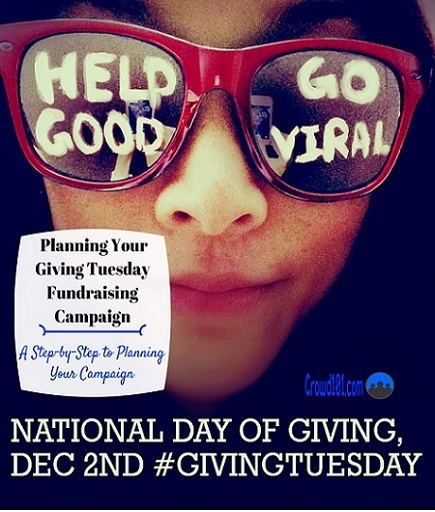 Plan on launching your Giving Tuesday fundraising campaign on Monday 30th of November. That gives you both Cyber-Monday and Giving Tuesday for your first two days of fundraising. Past campaigns show that if you can lock up around 25% or more of your funding goal over the first couple of days, you’ve got a good chance of being highlighted by the website as a ‘hot’ campaign on most crowdfunding sites. This means a lot in bringing more than just friends and family to your Giving Tuesday fundraising campaign. One of your first steps is to decide on which crowdfunding platform you’ll run your Giving Tuesday fundraising campaign. Kickstarter doesn’t allow non-profit only campaigns with no rewards. Putting together a basic set of rewards can get you on the platform but you might just want to go with Indiegogo or GoFundMe instead. GoFundMe is the favorite for non-profit campaigns but the site gets a lot of new campaigns this time of year. You’ll need to really work to distinguish yourself from the rest of the campaigns. I put together a detailed list of the 18 largest crowdfunding and fundraising websites including special features on each. Once you’ve picked a platform for your Giving Tuesday fundraising campaign, it’s a good idea to check out some of the other campaigns to see what works. Looking at failed and successful campaigns related to your cause can uncover a lot of do’s and don’ts. Pre-launch crowdfunding is all about building a base of motivated supporters around your campaign. When you finally launch your fundraising campaign, you’ll already have people sharing on social media and providing that first bit of credibility for your campaign through donations. Fail to build this initial momentum and you might be disappointed to find out there is no ‘crowd’ in crowdfunding. Start with your existing list of supporters and everyone in your personal network. With just six weeks of pre-launch for your Giving Tuesday fundraising campaign, you need to focus on really connecting with people on a personal level. Phone calls and online outreach are not going to cut it! Check out our prior post on crazy fundraising ideas to reach people in person. It’s a little more work to put offline events together but offer the best chance you’ve got at building a base of support and getting those immediate pledges for your first couple of days. Remember to go into these events with a small team of cheerleaders. You’ll be busy managing the event so it helps to have a few people with talking points that can work the crowd and make contacts. Once you’ve connected with people on a personal level, reach out to people by phone and email to really solidify their support. Develop a short three-part series of emails that hit on the best points of your Giving Tuesday fundraising campaign. Touch base with people over the phone a week before your Giving Tuesday fundraising campaign launches to tell them how they can support the cause and to get first day pledge support. For rewards-based and business crowdfunding campaigns, partnering with a local social cause will give your campaign extra credibility and boost your outreach. Non-profits are extremely busy towards the end of the year so you’ll want to connect and develop the partnership idea within the next couple of weeks. If you want to offer rewards for your Giving Tuesday fundraising campaign but are not sure what to offer, check out Anypromo.com for discounts on bulk promotional products. The site is the #1 supplier in the U.S. for promotional gear from branded pens to office equipment and tech gadgets. One of the most popular posts on the blog is our Ultimate Guide to Pre-Launch Crowdfunding Hacks. 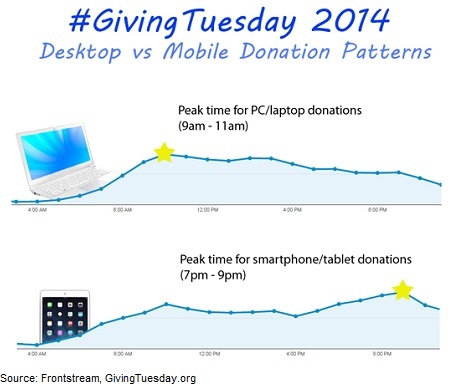 Check it out for more detail on how to build excitement for your Giving Tuesday fundraising campaign. The holiday season is going to be extremely hectic with your Giving Tuesday fundraising campaign so you’ll want to get all your holiday shopping done early. Once your campaign starts, you’ll have a full schedule of messaging and outreach. Social sharing on networks like Facebook and Twitter are where the real crowd is in crowdfunding so you absolutely must plan a strategy to get your message out. Make sure your pre-launch supporters know how important it is that they share your messages on the social networks, especially over those first two critical days. Get to know as many of your supporters as possible and get them involved in the campaign according to their strengths. With so little time to pre-launch and manage your Giving Tuesday campaign, non-monetary support through outreach and management can be just as valuable as pledging. Besides the off-the-cuff messages you send out, you’ll want to schedule some social media messaging in advance. Planning messages around different events and milestones will really help reduce your stress level and will keep communication flowing. One of the best crowdfunding tools available is the Hootsuite Pro social media manager, a website that allows you to link your social media accounts and message from a single page. You’ll be able to schedule messages in advance and even reply to messages from the site. It’s a busy time of year and you need to constantly be in front of people to remind them the importance of their support. Hootsuite or other social media tools like Sprout Social will save you a ton of time. Whatever you do, don’t get discouraged and fall for some of the crowdfunding promotion scams on the internet. Too many campaigns fail to live up to expectations and people end up throwing money at crowdfunding service providers. Check out this post for a review of crowdfunding promotion services and what really works for getting the word out. Six weeks isn’t a lot of time to plan and pre-launch a Giving Tuesday fundraising campaign but it’s your best opportunity at meeting your annual fundraising goal. Don’t put it off another day. Check out some of the posts on the blog to help you plan your Giving Tuesday campaign and reach out if you’ve got any questions.